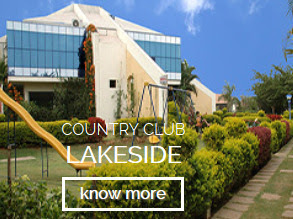 The Country Club Lake Side is located on the bustling Hospur Road that connects Bangalore and Chennai. It is a premium leisure hospitality hub in the city that boasts of several member exclusive family clubbing, trendy holiday, sports and banquet amenities. Several nearby attractions compel the tourist to visit the city. Some of the tourist locations to be explored around are Nandi Hills, Sangama/ Meke Daatu, Bannerghatta National Park, Shivanasamudra Twin Water Falls, and Nritya Grama Dance Village. Whether you are looking for an excursion or a relaxing time, The Country Club Lake Side brings the best of both worlds. Engage yourself in leisure activities at the resort by relaxing at the swimming pool, or playing at the Football Ground, Tennis Court or Indoor Games. The resort also has a dedicated children play area to keep the kids happy and busy. For adventure lovers, the dedicated travel desk will help arrange for Para Gliding, Go Carting, Rock Climbing, Adventure Water Theme Parks or White Water Rafting. The Country Club Lake Side has a multi-cuisine restaurant and bar to match your taste buds. Enjoy a barbeque in the party lawn with your family. The resort has all facilities and amenities to ensure your stay is nothing short of pleasant. Visit with your family, friends or your office colleagues, the staff at Country Club Lake Side is trained to meet your needs and bring the best of vacation experience to you.